We don't usually do much for Valentine's Day. I've never been very into it, beyond my elementary school years when valentines for classmates were compulsory. Occasionally Ryan might get some flowers or I might make a meal that I know Ryan loves, but we keep it pretty low-key. Awesome! Way to go Ryan! 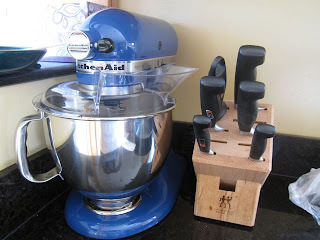 I loved my kitchenaid and was sad to leave mine behind in the states (the voltages are different here and I didn't think it would make the transition). Surprises like that are the BEST! I'm so excited for you! Our kitchen-aid was a wedding present from the wife of my dad's co-worker... and whom I have STILL never even met! It pays to rub shoulders (or have your dad rub shoulders, I guess) with rich people! Enjoy your kitchen-aid, they really are great to have! I recommend plain old cookies... How can you go wrong? OH. And be careful not to leave the attachments screwed in. We did that once and accidentally flipped it on while the other attachments were in the bowl and it stripped the gears and broke! It took finding a licensed repairman and $90 to get the thing fixed! So be careful!